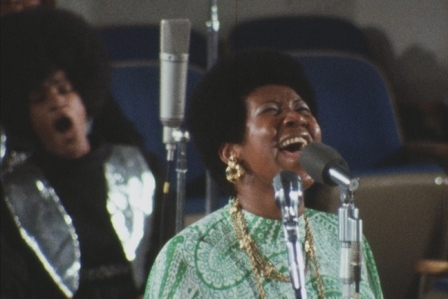 The Queen of Soul is immortal and the new documentary “Amazing Grace” which opens April 5th will make you feel like you’ve walked back in time to 1972, the year they filmed the concert. There is a legacy of drama that is part of the story that must be shared. The concert footage was buried under in lengthy legal squabbling for a long time. It was only after the passing of the great Aretha Franklin were the new producers able to release the material. “Amazing Grace” begins in the 1970s where Aretha Franklin was one of the biggest superstars in the world has put the tiny recording studio of Muscle Shoals on the map. In the now iconic studio, she sang Otis Redding's “Respect” and the world gave her just that—respect and adulation. She sang "I Never Loved a Man (The Way I Love You)” and "Chain of Fools” and she had the world bowing down at her feet. But maybe the Church girl in Franklin remembered the teachings of Jesus on the fleeting illusion of power. Maybe the words from the scripture "The eye of a needle" bounced around in her head. Maybe surrounded by all the trappings of earthly success she remembered the scriptures perfectly: “I tell you the truth, it is hard for a rich man to enter the kingdom of heaven. Again I tell you, it is easier for a camel to go through the eye of a needle than for a rich man to enter the kingdom of God,” said Jesus Christ. Maybe … but whatever the reason, Franklin went back to her roots as a singer in 1972, recording an album of gospel music — but not in a studio, not even in Muscle Shoals. No, she went to Los Angeles inside Watts’ New Temple Missionary Baptist Church and Warner Bros. Pictures hired Sydney Pollack to direct a film of the two-night session. And the long road to getting the film to an audience begins because that footage was never released even after the album Amazing Grace, became a massive success. After director Pollack’s death, a producer tried to finish the film but it was blocked by Franklin. And so it continued … at every turn when “Amazing Grace” tried to screen at festivals, Franklin’s legal team would issue emergency injunctions, claiming that she never gave permission. Now that the great Aretha Franklin has passed from this world, the world is free to view one of the best film concerts ever captured on film. “Amazing Grace” will give you chills. The right kind. The kind of chills that circle your soul to comfort and to inspire. 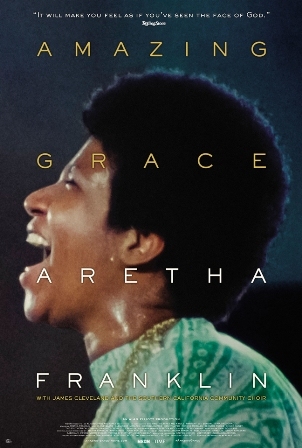 Shot in 1972 over a 48-hour period in Los Angeles inside Watts’ New Temple Missionary Baptist Church, this amazing documentary captured the live recording of the most successful gospel album in history, Aretha Franklin’s “Amazing Grace”. What is given by God no human being can take. Amen and the late Aretha was a marvel. At the pinnacle of her power, with 11 number one singles and five Grammys to her credit, she returned to the roots of the church a place that fueled her creative spirit. What came next was one of her biggest selling albums, earning a Grammy and a place in musical history, amen. Aretha Franklin’s “Amazing Grace” is many things and it just might be an Academy Award winner, if it catches a nomination but for some, I suspect, it’s an intimate love letter to the African-American Church. A child of the church, I spent years inside the church. Sitting on the hard pews and singing in the choir. The music can move a sinner to repent and make a believer almost levitate off the ground, amen. In watching this peek into history, it gives that same burst of energy because you hear the one and the only Aretha Franklin as your lead soloist. Where your soul and imagination goes after that is your own personal experience which is much like church. The album (Atlantic Records) which you can listen to online via YouTube now has images to bring the experience to a higher level. The Re’s Master of Ceremonies and gospel legend Reverend James Cleveland adds the right touch. In term of just words, the shy diva says very little why should she, really—her voice is still speaking, shouting, moving and will until time ends. 1972 is alive again as the camera catches her in rehearsal asking what key she should be singing in, and when she can’t get a straight answer she tosses Rev. Cleveland the side-eye. Rev. Cleveland is a showman playing to the camera and his devoted crowd while never losing control. Unless you are made of stone, I dare you (I do) to listen to the song, Amazing Grace and not go there. When Aretha [Re] sings that hymn the reverend is overwhelmed with emotion hit so hard that he gets up from the piano and openly weeps on camera. Amen. He’s listening to Aretha in the house of her God and his. And she just doesn’t just sing. No, shes. i. n. g. s. —and the camera does not miss a single bead of sweat pouring down her face. Providing vocal power is the Southern California Community Choir singers graced with vocal power. The singers give their all with the call and response backup on songs like “The Old Landmark” and “How I Got Over”. Rev. C.L. Franklin, Aretha’s father, gives a brief sermon and in a moving moment, he wipes the sweat from his daughter’s face while she sings. The Apple did not fall from the tree and Rev. C.L. Franklin steps into “Amazing Grace” with as much power as his daughter, delivering that almost immortal old-time Baptist minister style that today’s preachers simply cannot replicate. In this documentary is the first song she ever recorded, “Never Grow Old” and the assembled (no surprise) caught the Holy Ghost. This was filmed in 1972 by the great Sydney Pollack and his crew. There is a legacy as to why it took so long to get this documentary made. It literally sat inside a value for 35 years before the producer, Alan Elliott took up the challenge. This is a powerful documentary. It’s a must-see. “Amazing Grace” is moving and very cathartic. Aretha Franklin’s “Amazing Grace” opens wide April 5.